In Vermont’s opioid treatment system, devised ingeniously by Gov. Peter Shumlin with Affordable Care Act funding more than five years ago, opioid treatment programs (OTPs) are the hubs, and office-based physicians prescribing buprenorphine are the spokes. 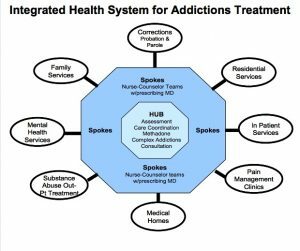 This hub-and-spoke system has solved two massive problems for office-based opioid treatment (OBOT) providers: 1) the OTPs are the experts in assessment, and decide along with the patient whether methadone in an OTP or buprenorphine in an OBOT setting would be better; and 2) the OTPs are the experts in induction with either medication—buprenorphine or methadone. Many OBOT physicians without experience treating addiction have been unsure about how to perform this procedure and how to get new patients stable. Primary care physicians in particular are uncomfortable with having patients in withdrawal in their offices, and buprenorphine induction requires that the patient be in mild withdrawal, with logistics often calling for the physician to send the patient home, to return when in withdrawal. The hub-and-spoke model began with a hub in central Vermont whose role was to perform inductions and get people stabilized, she said. The state also developed buprenorphine regulations for Vermont that were stronger than the federal regulations (DATA 2000) for OBOT, requiring that an assessment be conducted to see if counseling would be necessary. Now that the program has been off the ground for several years, Vermont no longer has the higher match rate for Medicaid. But the hub-and-spoke system is continuing at full speed ahead. Other states have not committed to the hub-and-spoke initiative, which is costly without the kind of waivers Vermont received from the federal Department of Health and Human Services. In the meantime, Richard A. Rawson, PhD, is interested in assessing the hub-and-spoke model. Dr. Rawson grew up on a dairy farm in Vermont and graduated from the University of Vermont before going on to head UCLA’s Integrated Substance Abuse Programs (from which he is now retired). He reportedly plans to retire in Vermont. After spending decades setting up OTPs in California, he returned to Vermont and was astounded by the extent of the opioid problem there, he told the Valley News last month. Later this year, Dr. Rawson, in collaboration with the University of Vermont, will begin an assessment of the hub-and-spoke system. Mark Parrino, MPA, president of the American Association for the Treatment of Opioid Dependence (AATOD), told AT Forum that the hub-and-spoke model is an idea that many OTPs could adopt. They could form partnerships with local physician groups, as Ms. Cimaglio also suggested, and then refer certain patients who would be suitable for OBOT with buprenorphine to those physicians. And Mario A. Moreno Zepeda, spokesman for the Office of National Drug Control Policy, said that the administration supports “models that integrate care for substance use disorders with mainstream medicine, such as hub and spoke.” He added that many people still do not have access to effective, medication-assisted treatment. OTPs themselves can dispense and give take-homes for either buprenorphine or methadone. OBOT physicians can dispense and prescribe buprenorphine. Looking forward, Ms. Cimaglio said it’s time to leave the “traditional OTP” behind, moving towards what the Vermont-style hub could be: part of an integrated health care network. “There are a lot of opportunities for partnerships, with hospitals, with physicians,” she said.